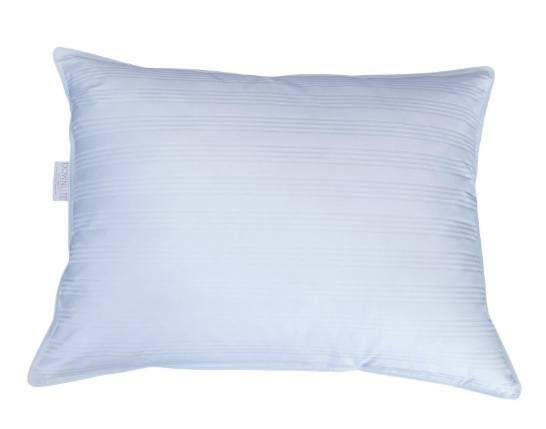 Everyone has their own favorite pillow to sleep with, whether it is cool, or firm, or covered in 100% cotton, there is just something about it that makes it absolutely perfect and essential for our sleep. 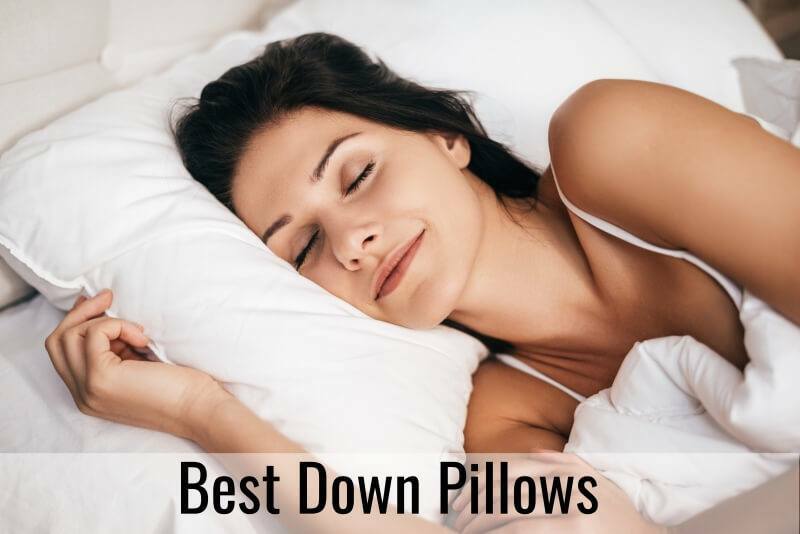 Maybe you have tried a variety of filings for your pillow and they have not worked out or maybe they have but you’re curious about the down pillows anyway. Down pillows are made for the warm feathers on a goose under the outer layer known as down feathers. The down makes for a fluffy, yet firm pillow that is incredibly comfortable to sleep on. 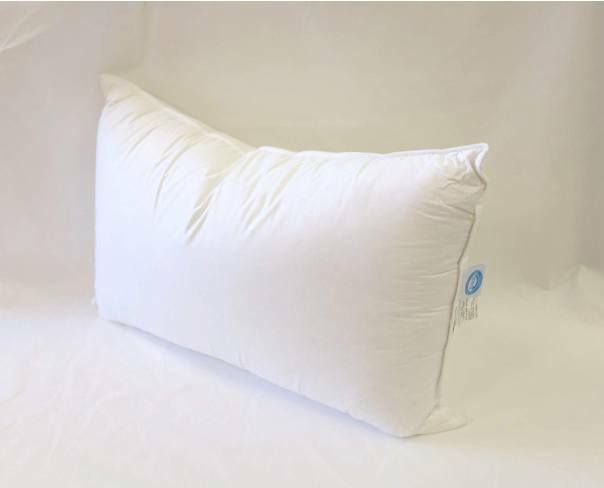 Down pillows can often be ordered in various sizes and not only in differing sizes but they can be adjusted by removing and adding fill. This is a list of pillows compiled to help you narrow down the search to the best pillows so that you do not have to waste your time and money seeking the best option for you. Continental Bedding has high quality products from the filling to the casing and even the stitching is made to be high quality. Though they are slightly more expensive than other options, the quality is worth the price tag attached. Cotton cover: Each pillow selected for this list is covered in a 100% cotton casing be it regular or egyptian cotton. Machine washable: I do not like to struggle trying to keep my pillows clean, I’d rather toss them in the wash so i chose pillows that can do this. Comfort: Only the most comfortable pillows were chosen so you are not tossing and turning on a lousy pillow all night. Support: The pillows here are not only comfortable but they provide more than enough support for your neck and head. Durable: I also do not like to purchase new pillows every few months, so I chose only pillows that lose their quality over time and need replacing often, so i chose durable options for myself and for you as well. Downlite’s option for a down pillow is one that is great for stomach sleepers, which you may not expect. It is actually not especially fluffy, but flat enough to comfortably sleep on your stomach or your side. 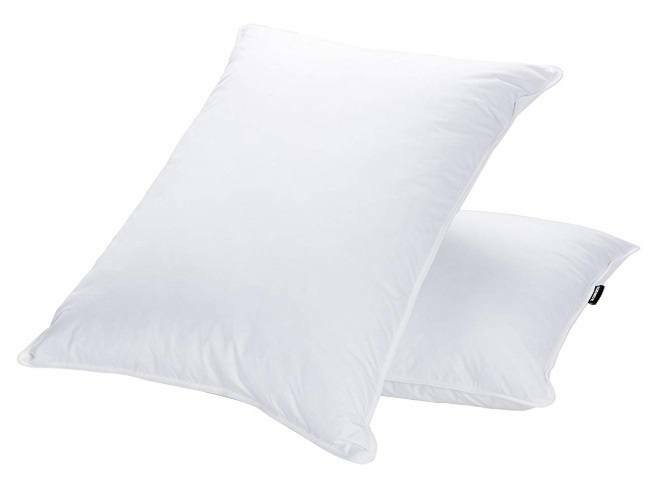 The fill on these pillows is between 525 and 550 goose down feather and is covered in a casing that is 250 thread count cotton, so it is very soft against the skin. It is fairly easy to keep these pillows clean whether you cover it with a pillow case or if you choose to go without, you can wash and dry the case. You can order this pillow in one of three sizes, either standard, queen or king size for whichever bed you plan to put it on. You do not have to worry about allergens as well as the pillows are certified to be hypoallergenic. When it comes to these down pillows you can choose no only the size and the number of pillows that you are getting but you can choose whether or not you order soft or firm pillows. Softer pillows may be more ideal for stomach or side sleepers, and firmer ones for back sleepers, although that is really up to you for what you like best when going to sleep. These pillows will run a lot more money than you may have thought, though buying a two-pack is a better option as you end up paying less for the two than you would buying them separately. You can choose one or two pillows and the soft or hard options for the standard size, the queen or king. There is a very high thread count in the 100% Egyptian cotton casing of the pillow, it is a four hundred count. The fill for the pillows will be around 550 making them a decent sized pillow, firm enough without being too firm. Sable Pillows have actually created wonderful pillows that are not going to break your bank, but the lower price does not mean lower quality. The queen size pillow is around forty dollars while the king is closer to fifty-six dollars, so you should decide ahead of time which size is best for you. You may also like this pillow because it is fully adjustable, and you can make the height grow or shrink by adjusting the fill size of the pillows. The case is made from 100% cotton and has a blue trim around the edge making it stylish even when you do not have a case on it, though i suggest that you do purchase a case for it to keep it clean. The pillows are guaranteed to be both hypoallergenic and antibacterial, keeping unwanted irritants and allergens away from you and your loved ones. If you get the pillow dirty then you can wash it in the machine and set it to tumble in order to get it dry. 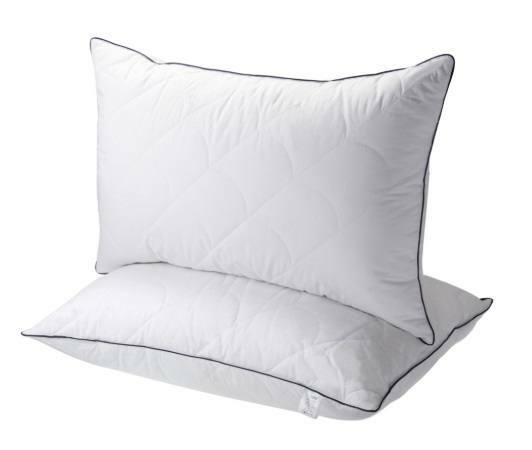 Puredown’s down pillows are actually a mixture of goose feather and down feathers, and encased in a 100% cotton shell. The goose feather mixed with the down helps it to be more plush and soft, and the cotton casing makes it soft for your face to rest against as well. If you are one to care for the ecosystem, then you’ll like what this company does by using recyclable materials that are environmentally friendly. They are a bit less expensive than other options which means you are helping the environment, cushioning and supporting your head and not causing you to spend a lot of money. You can order plain white pillows or pillows in the color, cool blue and while they are easy to clean you should still put a case on it. You can choose standard sizes for the kids, queen or king for the guest room and king for your bed. These down pillows by Ja Comforts is made with mainly goose feathers and some down as well. This makes the pillow more fluffy and it is then wrapped in a cotton fabric that is breathable and keeps dry. You can choose from the standard size that is also called a queen or a king size pillow and they only differ about six dollars in price so `i would advise you to just go for the king size for more comfort. The pillow is filled with 37 ounces of the feather and down, making it not too heavy but filled enough to provide ample support and comfort. The pillow itself needs some time to inflate after being packaged and sent to you, give it time to fill up to it’s normal size. You can machine wash this pillow and dry it without worrying that it will get damaged or lumpy. You can try to test out all of the pillows at the store and on the internet but you’d be better off going through the list compiled here. There are options for soft or firm pillows as well as differing sizes for everyone in your family.